About: CrossTimber is ran by The Dehnart Family. This is a Christian company providing some amazing name meanings to products. 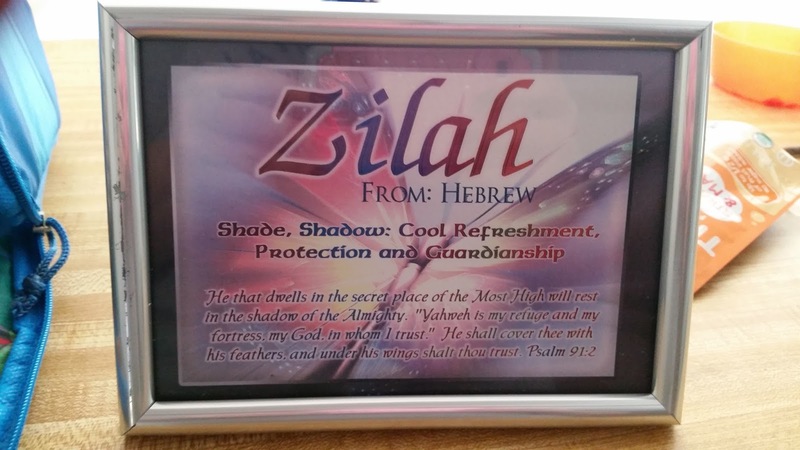 I recieved the Personalized Framed Plaque with Name Meaning and Bible Verse. This was a 5x7 framed picture that I chose to use the name Zilah. The Dehnart family is really great about talking with you personally about what each name means and how they come up with it. Or if you are like me, I enjoyed the surprise when I recieved my finished product. They have many background choices to choose from as well as a few options on frames. They also offer a a few other products thst you can personalize as well. Ordering is super easy. I went to their page and chose the size, frame, and back ground. you then enter the name you will want the meaning for. I did not choose to talk with them about the meaning of Zilah prior to getting my frame. Zilah was a baby that was born to soon into the hands of the Lord. I have not been able to find anything that I liked enough to remember her by and when I was offered this review I instantly knew this was meant for her. So I wanted to be surprised when I opened it up and seen it. I will just say I was in tears when I opened the package and seen her name right there in all the beauty. Also the personally pick bible verse they added was just perfect. God usually knows what you need and I think he made sure they knew what I needed as well. This is a wonderful company to work with. It was truly a blessing to get such a wonderful frame and picture. They have many other things you can get the name and meaning on as well. Through Dec 4th, CrossTimber are sponsoring a Name Gift Giveaway. You can enter the giveaway for a chance to win another free Name Gift or $10 gift certificate! Be sure to check them out on Social media as well as see what my fellow crew members had to say about the company and their personalized items.